From how massive humpbacks glide through the sea with ease to the efficient way fungal spores fly, applied mathematicians at Harvard have excavated the equations behind a variety of complex phenomena. A team of applied mathematicians and evolutionary biologists, with help from Harvard's rich museum collection, demonstrated that simple changes in beak length and depth can explain the diversity of beak shapes within Darwin's famed finches. In a study appearing in the February 16 Early Edition of the Proceedings of the National Academy of Sciences (PNAS), the researchers demonstrate that simple changes in beak length and depth can explain the important morphological diversity of all beak shapes within thefamous genus Geospiza. Broadly, the work suggests that a few, simple mathematical rules may be responsible for complicated biological adaptations. The investigation began at Harvard’s Museum of Comparative Zoology, where Campàs, a postdoctoral fellow at the Harvard School of Engineering and Applied Sciences (SEAS), and Ricardo Mallarino, a graduate student in the Department of Organismic and Evolutionary Biology (OEB) at Harvard, obtained photographs of beak profiles from specimens of Darwin’s finches. 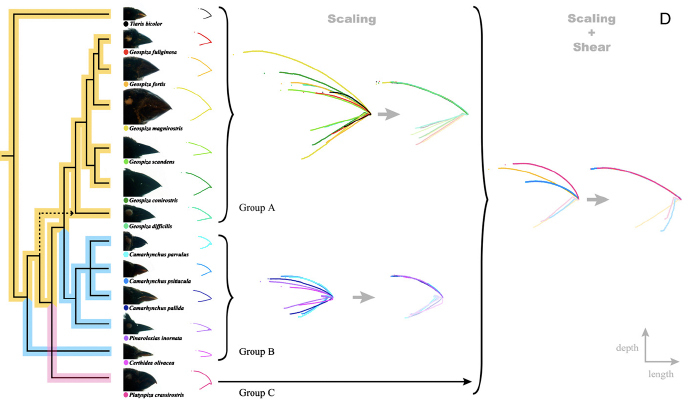 Using digitization techniques, the researchers found that 14 distinct beak shapes, that at first glance look unrelated, could be categorized into three broader, group shapes. Despite the striking variety of sizes and shapes, mathematically, the beaks within a particular group only differ by their scales. what happens when you transform a square into a rhombus by shoving the sides toward one another), with changes in length and depth, we can then collapse all beak shapes onto a common shape." verifying that the bone structure of the birds exhibits a similar scaling pattern as the beaks. Thus, beak shape variation seems to be constrained by only three parameters: the depth of the length for the scaling transformation and the degree of shear. Brenner, Glover Professor of Applied Mathematics at SEAS and researcher affiliated with the Kavli Institute for Bionano Science and Technology at Harvard University , says he is "astonished" that so few variables can help explain such great diversity. The mechanism that allows organisms to adapt so readily to new environments may be a relatively "easy" process. "This is really significant because it means that adaptive changes in phenotype can be explained by modifications in a few simple parameters," adds Mallarino. "These results have encouraged us to try to find the remaining molecules responsible for causing these changes." In fact, the mathematical findings also have a parallel genetic basis. Abzhanov, an assistant professor in OEB, and his collaborators explored the role of the two genes responsible for controlling beak shape variation. Bmp4 expression affects width and depth and Calmodulin expression relates to length. It turns out that the expression levels of the two genes, in particular Bmp4, are fundamentally related to the scaling transformations. regulate precisely such type of change. Now we want to understand how novel beak shapes resulting from higher order transformations evolved in Darwin's finches and beyond." different species of Geospiza, from one as large as that of a hawfinch to that of a chaffinch, and even to that of a warbler … Seeing this gradation and diversity of structure in one small, intimately related group of birds, one might really fancy that from an original paucity of birds in this archipelago [Galapagos], one species had been taken and modified for different ends." The researchers acknowledge the support of the National Science Foundation through the Division of Mathematical Sciences, and the Materials Research Science and Engineering Center, both at Harvard; the Kavli Institute for Bionano Science and Technology at Harvard University; and the National Institutes of Health.